Part 2 of Dekline's TM, Mike Sinclair and his photo update from the #brokeandstokedtour. Made a visit to Home Skateshop. Stopped in for a session at Riot Skatepark. Came to Indiana for this spot. Saw Big Boi in a switch tre position. Anonymous Skateshop in Cincinnati welcomed us. Special message from our Nashville bro! Cole Wilson nailed it this trip! 18 days... 11 states, cheers to the Dekline #brokeandstoketour! Dekline Footwear's Fall 2014 footwear collection is now available. Click here to view the entire offering. Pictured is Blake Carpenter's signature AM colorway for the Bixby. MIA Skateshop employee Lazaro Reyes is a bonafide loyal pawn. When he's not helping facilitate our brainwashing efforts in the skateshop, he's in the streets of Miami shredding is face off. Here's some epic skate photos of Laz, including his Top 5 favorite things about the Miami skate scene. 4.Trying to figure out what someone is trying to buy they don't speak English or Spanish. That's always fun. 5.Making up new names for when people call the shop and ask for me. 5. Overall good times. It's the best shop in Miami and the best dudes. 4. Went to that new Perez art museum downtown, it was pretty tight. 5. Driving around looking for spots in the rain. Leo Romero solves the riddle of a tall front board across and down a kink. As seen in the August 2014 Thrasher mag. The Dekline team is breaking in the new team van for the rest of July, filming for our video, True Blue. Here's photo update of the Broke and Stoked tour from Dekline Team Manager, Mike Sinclair. Picked up the crew at Donald Dust's palace. Then we headed over to Jlay's baby shower for some best wishes and some great BBQ. Baby Charlie is dropping soon. "Charlay" as Johnny claims. Co pilot Hambone aka Joe Hammeke, Thrasher Magazine staff photographer. Just less than an hour outside of Los Angeles and we got the new van stuck on side of the road in Blythe,CA. Stayed the night in AZ at Jaw's house. Trying to beat the AZ heat. Checked out this little gem on a quick stop in Flagstaff, AZ. Surprise stop in at Oncore Skateshop located in Flagstaff. Shane Powell picked up Ryan Spencer and Merlino who arrived before us coming from Berlin, Germany. This is why we were late. Merlino gets it in before the cops arrive in downtown Nashville. Shane Powell shows us the best Nashville has to offer. Shane rules. Tum Yeto fam, Jeremy Leabres hopped in the van with us. Eli busted it, then got busted. Another guest on the trip, Cole Wilson. He's amazing! A must when in Nashville. Surprise visit at Franklin Skateshop. After demo signing at Six Ave Skatepark. Thanks for all the support Sixth Ave! Fred Water came through! Thank you Ashton and Fred Water! But not before one more quick hit downtown. Thank you Shane, FU Crue and all the Nashville bros! Stay tuned for another update from the road in part 2. Follow the hashtag on Instgram #brokeandstokedtour for daily updates from the team. RVCA Sideways Tour from RVCA on Vimeo. The RVCA Sideways tour video features Jeremy Leabres and some of the RVCA team skating through Belgium, while visiting a few breweries and abby's for some fine beer tasting. Video by Lucas Fiederling, photos by Sam Ashley. Colt Bowden is a professional sign painter and artist hailing from Brea, California. We interviewed Colt to discuss the new Toy Machine board series he hand painted, aptly called the "Sign" series. Colt tells the back story behind each board graphic and how he drew inspiration from the Toy Machine pros. T-Spliff has been on a killing spree this past year. Counting the last 16 months, Taylor has dropped 3 gnarly full length video parts. Today Thrasher Mag shared Taylor's latest video party in Tee-Hee; a video by Tum Yeto filmer Don Luong. Check out his new part and peep Thrasher's photos and video coverage from Taylor's surprise pro party. All photos courtsey of Thrasher Magazine. Click here to see lots more photos from the party. Riley Hawk is hyped for his fellow Shep Dawg. Kodi Boi taking care of the cake. FoSkCo head honcho Tod Swank and his daughter Zoe came to party. Corey ventured down from Duffleland for the celebration. Video courtesy of Thrasher Magazine. Video courtesy of the Shep Dawgs and Jacob Nunez. Shepdawgs filmer Jacob Nunez is stoked for the good homie! Lil Zoe was hyped on the festivities. Demand from your local skateshop! T-Spliff pro deck available everywhere soon, including taco shops. Dekline Footwear is excited to announced a new addition to the Tum Yeto Collective! Habitat Skateboards is "Movin RIght Along". from Habitat Skateboards on Vimeo. Foundation Skateboards is proud to welcome Habitat Skateboards to the Tum Yeto Collective! PIG Wheels is proud to welcome Habitat Skateboards to the Tum Yeto Collective! Manual Magazine out of New Zealand filmed a shoe review wear test of the Dekline Bixby. Check out the video to see how the Bixby held up after 16 hours of solid skateboarding. Check out their first impressions of the Bixby here. Tum Yeto Pocket Cam 21 Super Tour video takes you back across country to North Carolina and Florida one more time just to get showed up by a snakeboarder on a seven stair with the kink cut off. We also picked your least favorite Bowie song just for shits and giggles. Get annoyed with the worst angles possible and enjoy the Tum Yeto crew. 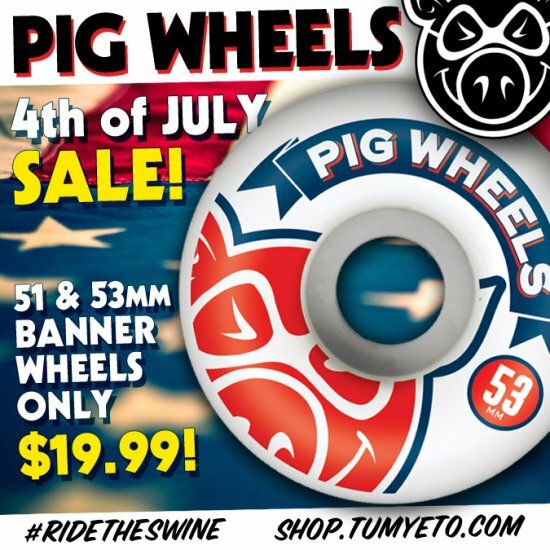 Click here to celebrate your Independence and get a great deal on some PIG Wheels! Dakota Servold sits down with Transworld Skateboarding Mag and explains the specs of his ride that gets the job done. An 8.25 with 139 Indys? He makes it work—there’re some bangers in this edit! Find all of Dakota’s products from Foundation, Dekline, Independent, Bones Swiss, Bones Wheels, and Bro Style at activerideshop.com. The best part of waking up, is Toy Machine in your cup. Skateboarding-wise, Alvin Flip creates the greatest cups of coffee ever brewed. He's amassed a huge following on Instagram, updating thousands of fans with his artisan cups of Joe. We first took notice of Alvin when he started tagging Toy Machine, notifying us of his bloodsucking cups of coffee. Since then, Alvin has brewed hundreds of skateboarding inspired cups of java; all out of a small coffee shop he works at in Indonesia . We wanted to catch up with Alvin to get to know a little about him and show off his loyal pawn-esque creations. This is the cup of coffee we first took notice of Alvin Flip's caffeinated creations. What's up Alvin, where do you live? I live in Bandung ,Indonesia. What's you favorite place to drink you coffee? Green Cake & Coffee is my favorite one. Inspired from the Colonial Foot Soldier's ditch ad. How long have you been a barista in a coffee shop? I work in coffee shop 2 years. I so love coffee. Loyal Pawn and Toy Machine intern, Otto Ray created a drawing inspired by Jeremy Leabres' "Welcome to the Team" photo for Emerica. World's collided when Alvin got a hold of it. Where did you learn to make all the cool cafe latte foam art? I learn coffee in 2 years for basic...I create for my own imagination....hehehe When did you start making the skateboard coffee art? When I first know how to make coffee. Do you create the foam art first try? Yes, I do it first try. Do you get special requests from customers for certain kinds of art in their coffee? Sometimes and I always have my kind of request. Any skateboarders request their favorite brands? Yeah Toy Machine of course and Emerica. An homage to the Farewell deck done for Austin Stephens. Do you create any other art besides coffee? Mmm... sometime I make a tie dye tees, if I have an order. 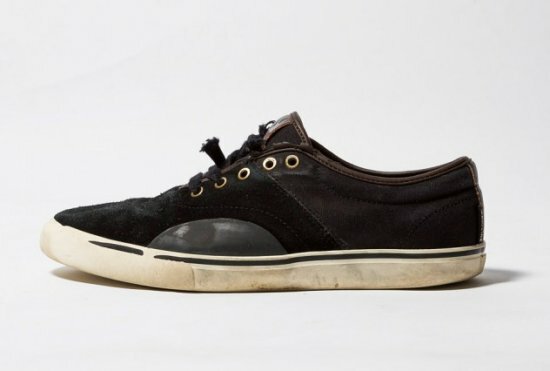 Activated from the sole of Collin Provost's Emerica X Toy Machine collab shoe. Thank you for always making rad cups of coffee Alvin. So great to talk with you.I love to create coffee for people to make them happy and I can smile looking my coffee made too...hehehe..that's all. Awesome, thank you Alvin. Keep up the great work! "I wanted to support my local shop (Palace 5ive) from across the country and this is what I came up with. Filmed a part in 5ive days to celebrate the relaunch of Palace5ive.com with their new web store...go buy something! "- Justin Damer. Filmed by Bryan Betz & Adam Mills. Chad Tim Tim delivers a switch crooked grind for his new ad in Thrasher Magazine.